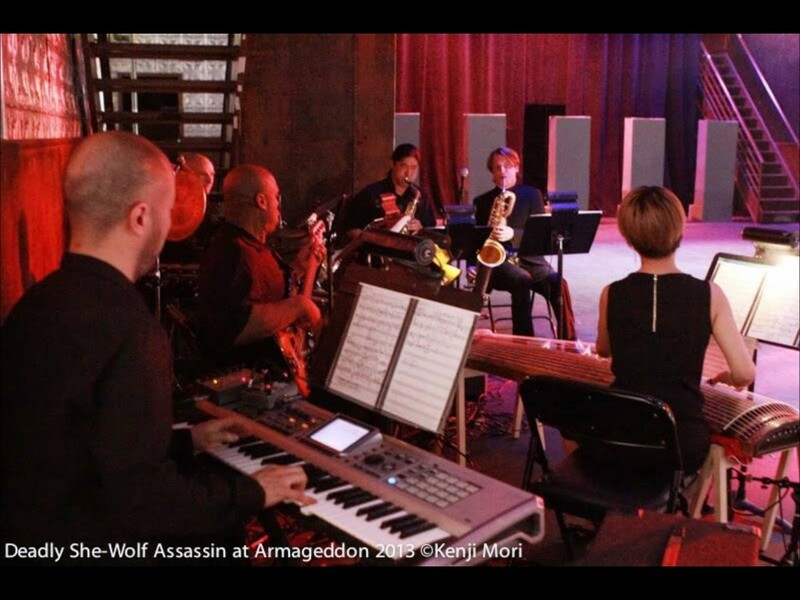 My experience with Fred Ho is limited to one thirty-minute phone conversation, when I interviewed the writer/musician/Asian American activist for a feature about the New York premiere of Deadly She-Wolf Assassin at Armageddon!, an Afro Asian manga opera he co-wrote with Ruth Margraff playing at La Mama through June 2. Despite the brevity of our encounter, I felt his presence in the Ellen Stewart Theatre while I watched the show on May 24, replaying parts of the interview in my head during certain points in the action. Based on Kazuo Koike’s manga series Lone Wolf and Cub, Deadly She-Wolf tells the story of The Rogue Assassin (played by New York’s most famous samurai, Yoshi Amao), who wanders Japan with his ten-year-old son (Bradley Fong and Jet Yung on alternating nights) as assassins for hire. Formerly the official executioner of The Shogun (Rick Ebihara), he seeks to avenge the death of his wife, who was murdered by the henchmen of Iyagu (Perry Yung). He doesn’t expect an encounter with the Deadly She-Wolf, a female assassin (the incredible Ai Ikeda), who is on her way to a showdown with the forces of evil. 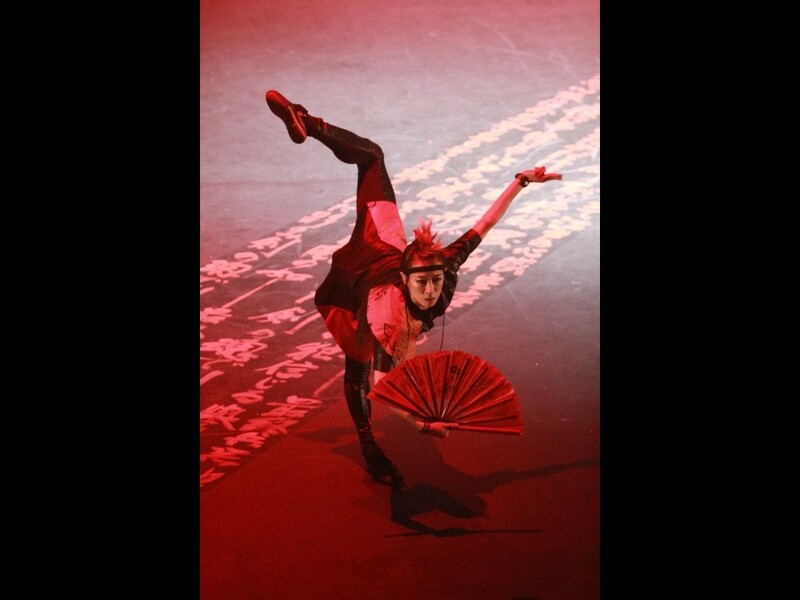 Although set in Edo-era Japan (circa 1603-1868), the costumes, dialogue, and aura are modern with a feel of the ‘70s. While creating a theatrical piece, Ho says he writes the music first to drive the story and the characters. In Deadly She-Wolf, Ho’s live band, The Afro Asian Music Ensemble, is almost a main character. Led by Masaru Koga, the band combines the ancient Japanese sounds of the shakuhachi (Koga), fue (also Koga), and 20-string koto (Yumi Kurosawa) with hip and contemporary jazz (Ben Barson, Wayne Batchelor, Art Hirahara, royal hartigan). The ensemble sets the tone for the scenes and complements the actors without being intrusive or overpowering. And you can totally feel the ‘70s blacksploitation vibe. @Deadly She-Wolf Assassin at Armageddon! Photo by Kenji Mori. Ho tapped Emmanuel Brown of Broadway’s Spider-Man fame to stage the martial arts sequences, while Amao choreographed the sword fighting. The action makes up a good chunk of the opera, but the fight scenes are entertaining and don’t go on longer than necessary. There are a few cool slow-motion moves a la The Matrix, but they aren’t overdone or overused. The action never feels like a gimmick. @Deadly She-Wolf Assassin at Armageddon! 2013 Photo @Kenji Mori. There are a lot of beautiful bodies floating around La Mama’s black box, each one acrobatic in this opera of energetic movement. Ikeda’s ballet training is evident in each scene; director Sonoko Kawahara describes her as having “the perfect blend between Western dance and Eastern martial arts.” Imposing in leather and sporting a Mohawk, Ikeda’s She-Wolf lithely glides with her weapons of choice, a fan and a blood-red piece of silk. The three larger-than-life super-villains – Bok Mei Lotus (Teake), Colonel Ulysses Sam Armageddon (Luca Nicora), and Qaseem the Killing Machine (the beefy Jerry Ford) – are the bravado that brings the comic book element of Deadly She-Wolf to the stage. Deadly She-Wolf Assassin at Armageddon! 2013 Photo @Kenji Mori. Beyond the baritone sax and the King Kong death palm-fighting style is a good story, one of facing the inner conflict of loyalty to one’s country (or master) and loyalty to one’s family (even if you didn’t know you had one). In this opera, everyone is a villain, but everyone is a hero. Bok Mei Lotus, Colonel USA, and Qaseem are intimate with betrayal and boast of their wrongdoings. And they do this without saying a word. They tell their stories through the voice – or voices, rather – of the omnipresent, all-knowing Narrator, played by the impressive Marina Celander. The super-cool calmness of the She-Wolf, the cocky Southern accent of Colonel USA, the ferocious hissing of the pure evil Iyagu take flight from Celander’s tremendous vocal chords. Deadly She-Wolf Assassin at Armageddon! is every bit as good as Fred Ho said it would be. Deadly She-Wolf Assassin at Armageddon! runs through Sunday, June 2. To purchase tickets, please visit La Mama’s website. Previous Previous post: It's Flashback Friday for JapanCulture•NYC's Birthday Week!